A section of the Cradleboard Trail is temporarily closed to protect ground nesting birds. A detour is in place, but the rough terrain may not be suitable for road bikes. An oasis of calm in the midst of urban life, Carolyn Holmberg Preserve offers a tranquil setting for both humans and wildlife. Bluegill (limit 20), Channel Catfish (limit 10), Tiger Muskie (limit 1 of 36” or larger), Largemouth Bass (limit 5 over 15″). Boats and float tubes are not permitted. The northwest shoreline is permanently closed. Summer Catfish Nights are held annually at Stearns Lake. Check the Hike & Events Calendar for details. 15 cars and 2 horse trailers at Stearns Lake trailhead. Stearns Lake trailhead can be accessed from Dillon Rd and 104th St. There is no access from 287 through Rock Creek Farm. The Carolyn Holmberg Preserve connects with the Rock Creek Trail. In the shadow of the Rocky Mountains, the Great Plains is dry, windy, and expansive. Receiving only small amounts of precipitation, the 1,136 acres of Carolyn Holmberg Preserve is dominated by grasses. The scarcity of water prevents larger shrubs and trees from growing, except along waterways. However, the soils are rich, allowing a wealth of other plants to thrive. These plants, in turn, support a variety of animal species. When gold was discovered near Gold Hill, miners streamed in to seek their fortune. Most people left broke and disillusioned. Some, however, started a new life farming. Two of those pioneers were Mary and Lafayette Miller. They came west in 1864 and purchased an 80-acre parcel of land on Rock Creek that included a hotel and tavern and a stage station. They also ran a cattle ranch and meat market in the area. During the past century, this open space property has been used to raise crops and livestock, and was also home to a dairy farm. 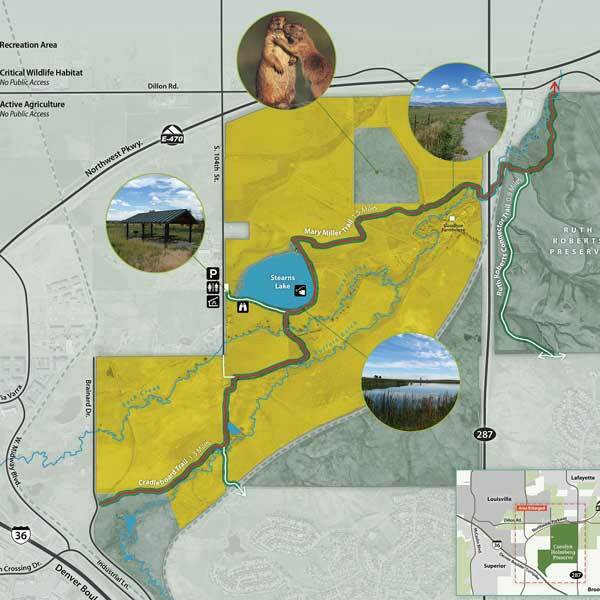 Boulder County purchased a portion of Rock Creek Farm in 1980 for agricultural preservation and as a buffer between the growing communities in southeastern Boulder County. The property is dedicated to Carolyn Holmberg, a former Parks and Open pace director who died in 1998. 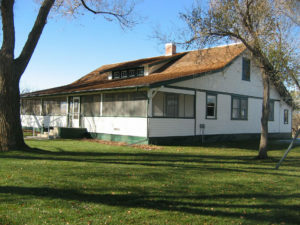 The Goodhue Farmhouse, rehabilitated in 2004, was originally built nearly 100 years ago. It is closed to the public, but is available to rent to municipalities, environmental and historical nonprofits, and other nonprofits that partner with Boulder County government. Learn more about renting the Goodhue Farmhouse.